This is the insane brain child of stand-up kings Eugene Mirman and Bobby Tisdale, who invite the best emerging and established comedic talent to try their new stuff every Wednesday night in a small lower east side NY club. This triple CD + DVD combo contains close to five hours of the best new material from the likes of David Cross, the guys from Stella, Todd Barry, Demetri Martin, Mike Bribiglia, Slovin & Allen, and twenty more. Also included are musical performances from Craig Wedren (Shudder To Think), Marcellus Hall (Railroad Jerk, White Hassle), and Langhorne Slim. This is a comprehensive document of the best of NY stand-up. 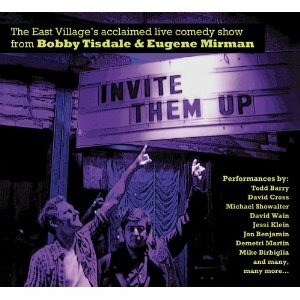 The DVD compiles over 100 minutes of extra and extended performances, including the famed Fuggedabuddies routine, bonus Eugene Mirman videos, and much more. Comedy Central. 2005.